Activate Your New Home for Digital Living! Are you part of today’s digital lifestyle? Do you use a digital camera to take photographs? Do you have DVDs of your favorite movies to watch again? Do you share files or a printer with more than one computer? Do you use the Internet at home for work, school or pleasure? Do you or your children listen to your favorite music on an MP3 player? 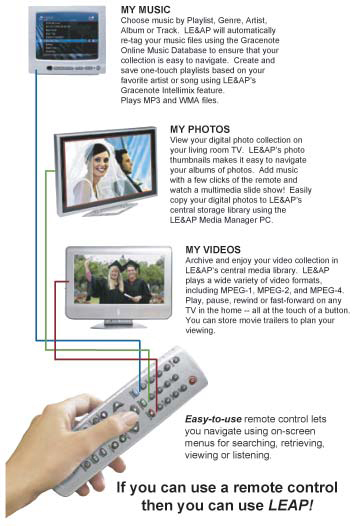 Then you need the Leviton Entertainment & Applications Platform….LEAP! Take control of the digital world all around you! Can play up to 4 videos or 8 music files at separate locations at the same time. Handles videos, music & digital photos. Plays content back on any networked TV. Can provide Internet access at 8 locations via a broadband ISP connection provided by the home owner. Optional expansion available for additional locations. Can connect all of your networkable computers, printers and other peripherals. Includes an 8 port expandable network router with a professional grade hardware firewall built in. The Digital Distribution Center (DDC) does the work of storing, organizing, retrieving and enabling digital content and is mounted near your structured wiring cabinet. The Media Player & Remote Control retrieve the material for use with your electronics such as a stereo system, television, etc. The Media Player is connected to the DDC through the CAT5e cabling in your structured wiring system. Using its 120 Gb hard drive, the DDC will store up to 120,000 digital photos or up to 24,000 songs or up to 120 videos. Additional memory can be easily added through the DDC’s four USB 2.0 ports. The Media Players are connected to your equipment using standard audio/video cabling. The included Remote Control provides an easy-to-use means of navigating by providing on-screen TV menus, making searching, retrieving and viewing or listening as easy as using a TV set and remote control combination. How Much Easier Could It Possibly Be? “Thumbnail” images of the photo folders or albums in the system allow you to quickly find the images you want. View photos one at a time or start a “Slide Show” of all the images in the album. Select music from your music files to attach to the album and play each time you watch it! Select How to View Your Music: Then choose from your entire library of songs to “Queue” up a few songs or to create a long “Playlist” to match your mood or for a party. You can easily sort your music by Genre, Artist, Album Name, or Song Name by using “Gracenote” the largest on-line music library in the world. “Prompts” at the bottom of each screen make the step by step process easy, with no complicated commands or difficult programming to remember. Customer must provide connection cables between the Leviton Set-Top Media Players and the specific television sets or other equipment attached to the Leviton system. Customer must have a Networked PC running Windows 2000, XP or newer Windows based OS with an installed, functioning network card in the PC, connected to the system. 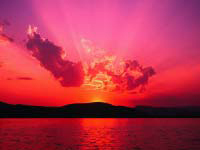 Customer must provide and use a screen saver for all television sets on the system, including plasma sets. The Most Versatile Whole House Audio Distribution System Available! On-Q has raised the bar for whole house audio distribution with the introduction of their Multi-Source/Multi-Zone LYRIQ System. In the past, you always had a choice as to where you wanted your speakers to be located, but all of the audio equipment, or sources, you wanted to play over that system had to be in one place, connected to the system’s “Input Module.” With the recent explosion of audio devices, such as MP3 players, digital music on your computer, satellite radio receivers and more, this was not always convenient. Now with On-Q’s new “3 + 1” input system, the problem is solved. Instead of having all 4 sources in one location, connected to a single input module, On-Q has split the system into two input modules; one module with 3 inputs and one module with 1 input. The 3 input module can handle your standard stereo components as they were typically connected in the past, but now you can place the single input module somewhere else. Use it for music stored on your computer, an MP3 docking station, a cable or satellite set top box, or some other audio source located in another room of your home. The possibilities are endless, provided the audio device can output a line level signal and be connected using standard RCA plugs. In addition to the 4 “master-zones” or speaker locations that come with the system, you can upgrade your system to a maximum of 8 “master-zones” or speaker locations, each capable of listening independently to any of the 4 input sources you choose. But just in case 8 areas of music are not enough in your home, you can add additional speaker locations or “sub-zones” to the 8 “master- zones” described above, to provide up to 32 rooms of music! Each of the additional sub-zone speaker locations, up to 24, would be linked to one of the 8 master-zones described above and would hear the same audio source as that master-zone. While this single LYRIQ system can easily be expanded to provide 8 independent stereo speaker locations, it comes standard with 4 locations. This option adds 1 additional room of LYRIQ music distribution to an existing LYRIQ Four Source / Eight Zone system(s) option # 03-021-F7430P. It includes and links an additional F-7394WH keypad and 1 Pair of SENSONIC MS-626 speakers to the existing LYRIQ system. Each of the resulting 5 locations could listen independently to any one of the audio sources connected to the system. This option adds a total of 2 additional rooms of LYRIQ music distribution to an existing LYRIQ Four Source / Eight Zone system(s) option # 03-021-F7430P. It includes and links 2 additional F-7394WH keypads and 2 Pairs of SENSONIC MS-626 speakers to the existing LYRIQ system. Each of the resulting 6 locations could listen independently to any one of the audio sources connected to the system. This option adds a total of 3 additional rooms of LYRIQ music distribution to an existing LYRIQ Four Source / Eight Zone system(s) option # 03-021-F7430P. It includes and links 3 additional F-7394WH keypads and 3 Pairs of SENSONIC MS-626 speakers to the existing LYRIQ system. Each of the resulting 7 locations could listen independently to any one of the audio sources connected to the system. This option adds a total of 4 additional rooms of LYRIQ music distribution to an existing LYRIQ Four Source / Eight Zone system(s) option # 03-021-F7430P. It includes and links 4 additional F-7394WH keypads and 4 Pairs of SENSONIC MS-626 speakers to the existing LYRIQ system. Each of the resulting 8 locations could listen independently to any one of the audio sources connected to the system. This option adds 1 “sub-zone” of LYRIQ music distribution to an existing LYRIQ Four Source / Eight Zone system, option # 03-021-F7430P. It includes and links 1 additional F-7394WH keypads and 1 Pair of SENSONIC MS-626 speakers to one of the master-zones of an existing LYRIQ system. The sub-zone would still be able to control the choice of which of the input sources you wished to listen to, however, it would not be independent. It would hear and control the same source as the master-zone it was connected to. You can add up to 24 sub-zones to the Lyriq system for a maximum of 32 speaker locations. A complete description of this option is shown later in this section. *Note: Because of IR sensitivity, the LYRIQ wall mounted volume control cannot be mounted outdoors. If outdoor speakers are added to the system, their wall control will be installed just inside the door leading to the exterior area with speakers. Multiple LYRIQ Systems may be purchased and linked together to provide coverage for additional rooms. Speakers installed more than 10 feet above the floor require Cathedral Ceiling Option # 03-000-CC. Now You Can Control Your Music From Any Location You Choose! No more running up and down the stairs to change a CD or re-tune the receiver. The On-Q LYRIQ music distribution system is a revolutionary new technology that makes traditional audio distribution systems obsolete. Using state of the art, high speed, CAT5e wiring, the LYRIQ system sends power, left and right channel audio, infrared control and system status directly to each keypad in the system. An individual, high quality, digital stereo amplifier, with preamp output, is built right into each keypad to prevent any chance of signal loss. Crisp, clean, high quality audio is now available in any room you desire. 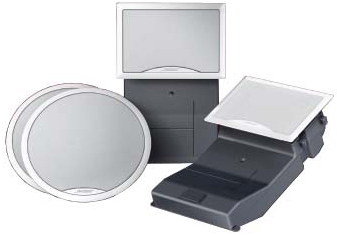 This four room LYRIQ system allows you to remotely control a single input source from any keypad location in your home. Additional single source systems may be linked together for distribution in up to 20 locations. With the exception of the Four Source vs. Single Source Distribution Modules and the accompanying Input Modules the components of this system are similar to the system shown on the previous page. See the individual item numbers. Connection to customer’s compatible equipment with customer cables and Demonstration. This option adds 1 additional room of LYRIQ music distribution to an existing LYRIQ system(s) option # 03-021-F7396P. It includes and links an additional F-7394WH keypad and 1 Pair of SENSONIC MS-626 speakers to an existing LYRIQ system. This option adds a total of 2 additional rooms of LYRIQ music distribution to an existing LYRIQ system(s) option # # 03-021-F7396P. It includes and links 2 additional F-7394WH keypads and 2 Pairs of SENSONIC MS-626 speakers to an existing LYRIQ system. This option adds a total of 3 additional rooms of LYRIQ music distribution to an existing LYRIQ system(s) option # 03-021-F7396P. It includes and links 3 additional F-7394WH keypads and 3 Pairs of SENSONIC MS-626 speakers to an existing LYRIQ system. 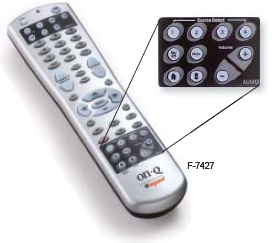 On-Q’s Universal Remote Control is the complete solution for all of your Audio Video Distribution Systems in DC, Maryland, VirginiaLYRIQ system control requirements. In addition to being able to learn the IR commands from your audio source controllers, the F-7427 introduces an innovative feature called Whole House Commands. Whole House Commands control all the keypads in the system from one keypad location. You can mute, change source and raise or lower volume for all the keypads without leaving the room. Imagine setting the music source for a party from one location and adjusting the volume to that perfect level. When the party is over, simply point the remote at the keypad to turn off all the volume controls in the home. Add a remote control for each floor to provide complete control throughout your home. Remote control units do not include any programming that may be necessary in order to allow them to control other manufacturer’s audio equipment. 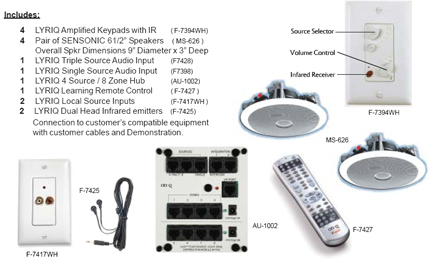 Audio Video Distribution Systems in DC, Maryland, VirginiaThe F-7417WH is an in-wall input module that automatically selects between an independent local source (e.g., a CD player in the room) and the main audio source of the LYRIQ system. This allows the user to override the main source and listen to a local source in only that room. Up to 3 Local Source Inputs may be attached to the system. Audio Video Distribution Systems in DC, Maryland, VirginiaTwo additional Dual Head IR Emitters can be attached to the single source audio input module allowing remote control of up to 6 devices. Only one audio output, however, is heard over the entire system at one time. This option allows the homeowner to install one area of LYRIQ distributed audio at a future date. One CAT5e wire is run from the distribution hub, or its future location, to the future location of a volume control Then 1 Audio Grade 14/4 wire is run from the future location of the volume control to the future locations of two speakers. The volume control, speakers and hub are not included and their locations are covered with blank covers. This option is priced and sold on a “per room” basis and includes exterior areas. Consider the hassle of managing your treasured, but unwieldy, CD collection. The BOSE BUILT-Invisible Music System changes all that with unique BOSE technology that stores up to 340 hours of music. The uMusic™ Intelligent Playback System actually listens to the music you select and learns your preferences and then makes selections based on what you like. No more searching for CDs or deciding which tracks to listen to when you want to hear a certain type of music. Whatever mood you’re in, the uMusic System is ready with just the songs you want to hear. And you can hear them almost anywhere. BOSE® link enables quality sound in as many as 14 additional rooms, even outdoors, as part of your Bose BUILT-Invisible Home Theater System. In addition, you can listen to non-system BOSE compatible products through the Local Input plate located in each speaker area. Includes a pair of BOSE Virtually Invisible model 191 speakers. Bose’s design, the “Articulated Array,” results in a superior presentation of the stereo information throughout the room. No more having to sit or stand in one specific spot to hear “optimum” stereo. These speakers fit your life-style instead of making your life-style fit them! In addition to your choice of rectangular or round grilles, which can be painted to match your décor, each speaker incorporates a rear enclosure (mounted inside your wall or ceiling) to enhance their bass performance. To complete the system, there is an individual remote control for each area of speakers that eliminates keypads on the wall. Now you can control your entertainment from your easy-chair. This option allows the homeowner to upgrade 1 pair of BOSE 191 speakers to the world’s best selling outdoor speaker – the BOSE model 251. This option is only available as part of a BOSE 5150 Music System. The cost to upgrade one pair of speakers is in addition to the cost of the 5150 system. This option allows the homeowner to upgrade one (1) pair of BOSE 191 speakers to the fabulous NEW BOSE Freespace 51 outdoor stereo speakers. This option is only available as part of a BOSE 5150 Music System. The cost to upgrade one pair of speakers is in addition to the cost of the 5150 system. 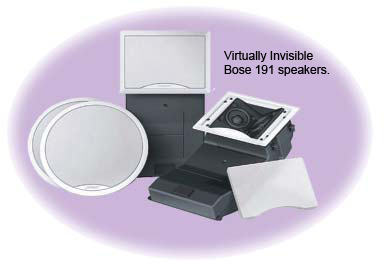 * NOTE: The Bose BUILT-Invisible Music System is only available as an addition to one of the Bose BUILT-Invisible Home Theater Media Systems (# 6718, 6738, or 6748) as shown in this catalog. The amount of digital music that can be stored is determined by the Home Theater System purchased. 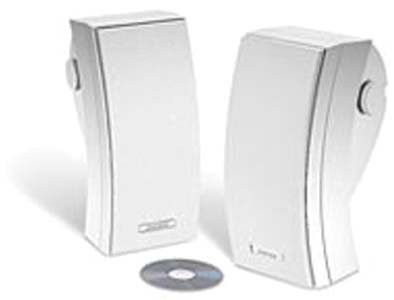 The music system is shown here for use in an interior location but may be used in an exterior location by upgrading to one of the Bose Exterior Speakers referenced. The music system is sold on a per room or outdoor area basis. Exterior speakers will include a Single Source input plate located inside the home where specified. Up to fourteen (14) areas of Bose BUILT-Invisible Music can be added to a Bose BUILT-Invisible Home Theater System. You can add both excitement and sophistication to your new home with the addition of a quality stereo sound system in the rooms of your choice. Designed to fill your individual needs, each room that you purchase speakers for, contains its own on/off volume control to provide sound where you want, it at a level to meet the moment. These high quality ceiling mounted speakers are ideal for entertaining or personal listening and blend seamlessly with any decor. Simply plug in an amplified audio source, such as those shown in the “Audio Video Distribution – Electronics” section of this catalog, to the input plate and you’re ready to go! * Maximum number of speakers in this system is 10 pairs. 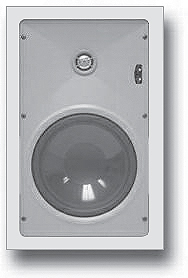 1 PAIR of SENSONIC MS-626 6 1/2” interior speakers with white paintable grille and frame. 1 Individual Interior On/Off Volume Control mounted near the light switch at the main entrance to each room with speakers. Rated 150w Peak, 50w RMS. 1 8ZADP Audio Input Plate per total system. Capable of connecting up to 8 pairs of speakers. Installed where the home owner indicates they intend to place their audio equipment. through each volume control to its speakers. Add a new stereo receiver / amplifier to take full advantage of your new system. * NOTE: It is the customer’s responsibility to assure that the audio amplifier that they attach to their music system is the correct power to properly operate the total number of speakers they plan to include in the system. For installation of speakers in any other location more than 10 feet from the floor Cathedral Ceiling Option # 03-000-CC is required. This option allows the homeowner to upgrade 1 pair of SENSONIC MS-Audio Video Distribution Systems in DC, Maryland, Virginia626 6 1/2” speakers to POLK RC80i 8” Ceiling Speakers. This option is only available as an upgrade for a Multi-Source / Multi-Zone Audio System or a Single Source / Single Zone Audio System. The cost of this option is in addition to the cost of the original system. This option allows the homeowner to upgrade 1 pair of SENSONIC MS-Audio Video Distribution Systems in DC, Maryland, Virginia626 6 1/2” speakers to BOSTON ACOUSTICS PC843LCR 8” Ceiling Speakers. This option is only available as an upgrade for a Multi-Source / Multi-Zone Audio System or a Single Source / Single Zone Audio System. The cost of this option is in addition to the cost of the original system. This option allows the homeowner to upgrade 1 pair of SENSONIC MS-Audio Video Distribution Systems in DC, Maryland, Virginia626 6 1/2” ceiling speakers to larger SENSONIC SS-838 8” three- way wall speakers. This option is only available as an upgrade for a Multi-Source / Multi-Zone Audio System or a Single Source / Single Zone Audio System. The cost of this option is in addition to the cost of the original system. This option allows the homeowner to upgrade 1 pair of SENSONIC MS-Audio Video Distribution Systems in DC, Maryland, Virginia626 6 1/2” ceiling speakers to PROFICIENT W680 6 1/2” wall speakers. This option is only available as an upgrade for a Multi-Source / Multi-Zone Audio System or a Single Source / Single Zone Audio System. The cost of this option is in addition to the cost of the original system. One: 1” aluminum dome pivoting tweeter. of rectangular or round grilles, which can be painted to match your décor. This option is only available as an upgrade for a Multi-Source / Multi- Zone Audio System or a Single Source / Single Zone Audio System. The cost of this option is in addition to the cost of the original system. This option replaces the pair of SENSONIC MS-626 speakers with a single SYLVANIA SC-622K 6 1/2” Dual Voice Coil speaker. This is an exceptional value for background music for small rooms or areas where people are seldom in the “sweet spot” or center of a room to actually hear both channels of a stereo program continuously. This option is only available as an upgrade for a Multi-Source / Multi-Zone Audio System or a Single Source / Single Zone Audio System. The cost of this option is in addition to the cost of the original system. 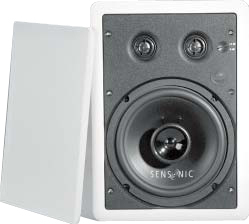 This option upgrades 1 pair of SENSONIC MS-626 interior speakers to 1Audio Video Distribution Systems in DC, Maryland, Virginia pair of SENSONIC SS-525WH WHITE, surface mounted exterior speakers for use on a deck or patio area. The speakers can be mounted vertically or horizontally. The volume control for these speakers is installed inside the home near the door leading to that exterior area. This option is only available as an upgrade for a Multi-Source / Multi-Zone Audio System or a Single Source / Single Zone Audio System. The cost of this option is in addition to the cost of the original system. This option allows the homeowner to upgrade 1 pair of SENSONIC MS-626 6-1/2″ speakers to the world’s best selling outdoor speaker – the BOSE Model 251WH. Now you can have Bose quality sound for your outdoor listening pleasure as well – on your deck, by your pool, on your porch and even in your garden. This time-tested design can withstand harsh elements for reliable performance year-round. This option is only available as an upgrade for a Multi-Source / Multi-Zone Audio System or a Single Source / Single Zone Audio System. Weather-resistant brackets and hardware Two 2 1/2” glass composite drivers in Articulated Array design. 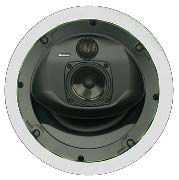 One 5 1/4” Polymer fiber woofer in multi-chambered enclosure. This option replaces the two SENSONIC MS-626 speakers provided withAudio Video Distribution Systems in DC, Maryland, Virginia the Single Source / Zone System Stereo System (03-020-626P) with a single PROFICIENT AW600TTWH exterior dual voice coil (monaural) speaker. Listening to music outdoors has always been a problem. When you move off-center, you miss critical sound. But Proficient has solved all that. With the Proficient AW600TT, you get even coverage throughout the listening area. Proficient’s dual voice coil, twin tweeter system masters the challenges of outdoor sound and wide-coverage installations. The AW600TT really cranks out the bass, even at low listening levels. Plus, it has twin 1″ soft dome, pivoting tweeters mounted in Slant-Back wave planes for enhanced high-frequency dispersion. You’ll get great coverage no matter where you are. This option is only available as an upgrade for a Multi-Source / Multi-Zone Audio System or a Single Source / Single Zone Audio System. The cost of this option is in addition to the cost of the original system. This option replaces the two Sensonic MS-626 speakers provided withAudio Video Distribution Systems in DC, Maryland, Virginia the Single Source / Zone System (03-020-626P) with a single exterior dual voice coil (monaural) speaker. 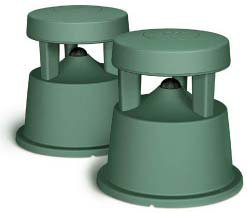 Sturdy Green Plastic Housing 8” Polycarbonate Woofer with Butyl Rubber Surround 3/4” Dome Tweeter. Rated up to 100 watts Combining both channels of sound from your stereo in this 360 degree design provides superior sound disbursement, while the 8” woofer out performs the smaller “rock” speakers so often seen outside today. 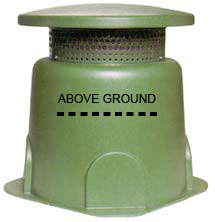 While installation is usually above ground, the homeowner may partially bury the unit with as little as 8” remaining above ground. This helps to camouflage the unit and also deters theft. Burial grade audio cable is used for the exterior portion of this installation. This option is only available as an upgrade for a Multi-Source / Multi-Zone Audio System or a Single Source / Single Zone Audio System. The cost of this option is in addition to the cost of the original system. This option allows the homeowner to have ceiling or wall speakers installed in ceiling or wall locations which are more than 10 feet from the floor. We strongly discourage these locations due to the negative impact such locations have on speaker performance, general acoustics in the home and any non-warranty service issues the homeowner may have in the future. Pricing is per room. This option allows the homeowner to install 2 stereo speakers or one 1 dual voice coil speaker, 1 volume control and an input plate at a future date. From the future location of an input plate, audio grade 14 gauge wire is run to the future location(s) of the speaker(s) and volume control(s) which are not supplied. 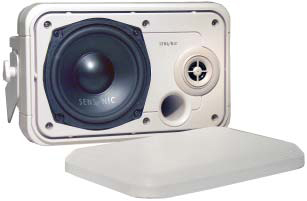 The speakers, volume control and input plate locations are covered with blank covers. This option is priced and sold on a “per room” basis and includes exterior areas. The Marantz SR4021 Stereo Receiver is designed for 2 channel theaters, or as a secondary zone receiver, with ample power, full video switching, and a host of other features.